Most of the time I make my own draperies, but for Caleb's room it sure was nice to pick up a ready made pair at Ikea for next to nothing! I chose the Lenda, two panels that are a really nice weight for just $19.99! However, the 98" length was a little too short. They come in a longer length but I knew I wanted to add some detail to them anyway so I saved about $10 by getting this length. I planned to add some stripes at the bottom, and wanted them to be more incorporated than just adding a piece of fabric to the bottom of the panel, so I did some cutting and piecing together. I was going to give measurements for what I did, but since everyone's would be different I'll just give you the basic idea. First, I wanted to use ring clips instead of the tabs at the top, so with some sharp scissors I just cut those off very close to the seam. Then, I decided where I wanted the bottom stripe to start, (my bottom stripe is about 3 1/2 inches up from the bottom hem), and while adding about 1/2" for a seam allowance, cut my panel all the way across there. Then, I used some black fabric to make a wide stripe (mine was 7" finished) and sewed it to the top section of the panel, then to the bottom section. So, now I had one panel again with a wide black stripe at the bottom. Be sure to press both seams open for a professional look! For the thinner stripe I sewed a piece of grosgrain ribbon on. Now, this window faces the east, so it gets bright very early in the morning. Even though we have blinds on the window, I wanted to add some blackout lining to the panels. I had some old panels that I wasn't using anymore, so to save some money I removed the blackout lining from them and sewed them right to the back of the new panels. I didn't do right sides together and turn them inside out like normal, I just sewed it right to the back as close to the edge of the lining as I could. My goal was to stitch right on top of the stitch lines that were already there. Along some edges I ended up with a double row of stitching, but I think it looks fine. So, with a few adjustments and using what I had, I have a custom pair of blackout panels for under $25! Now, to hang them. I bought a plain Hobby Lobby curtain rod a while back when I actually made the curtains (this room has been underway for over a year! 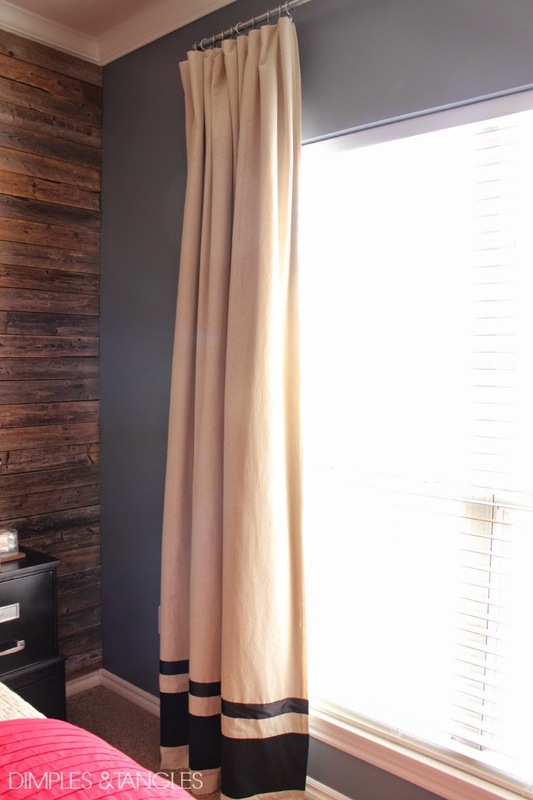 ), but as we worked on the wood wall I wanted a more masculine look. 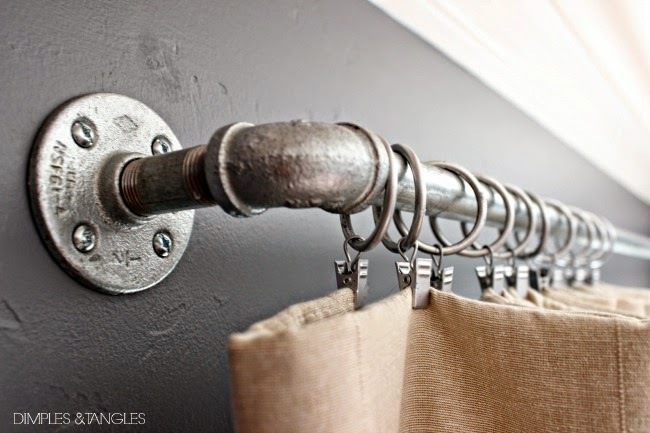 I started seeing industrial gavanized pipe curtain rods all over blogs, and I knew that would be a perfect choice! I'm not giving my own tutorial, since I followed Cassie's (Hi Sugarplum) excellent tutorial and it was super easy! My only piece of advice (that I finally figured out after my third store) is that your pipe needs to be from the PLUMBING department, not the ELECTRICAL department! I thought the employees didn't understand what I wanted when no one could help me cut and re-thread a 1 1/2" electrical pipe. Duh...can't be done! A 1 1/2" electrical (conduit) pipe is NOT the same as a 1 1/2" plumbing pipe, even though they both look the same! My original rod was cheaper, all of the parts for this one came in at around $35 for me. However, it's so much sturdier, and WAY cooler looking! Now his room is like a cave when the curtains are all closed up...I think I want to move in! One step closer to this room being done, and I actually think I'm going to be able to show you the reveal next week. For now, here's one final sneak peek! 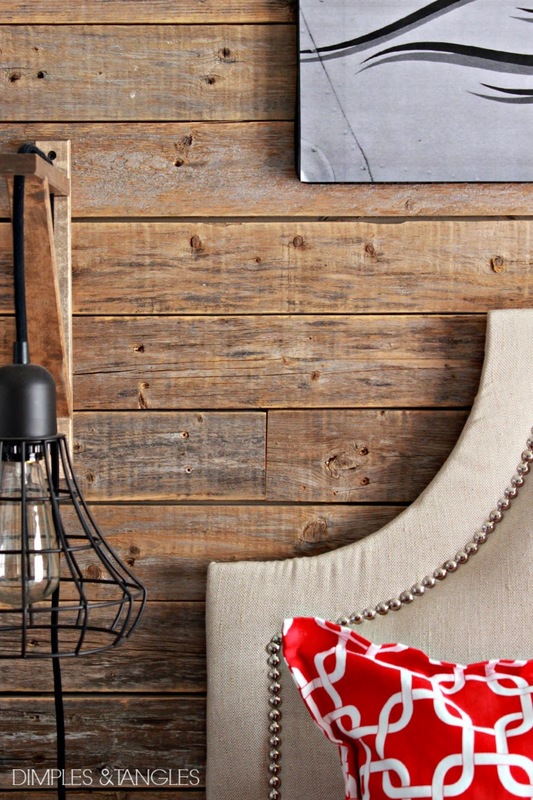 Edited: Click here to see this completed room! I love all of your projects for this room. Goes to show how much cooler a room is when you mix and match and create something unique! those look fabulous! 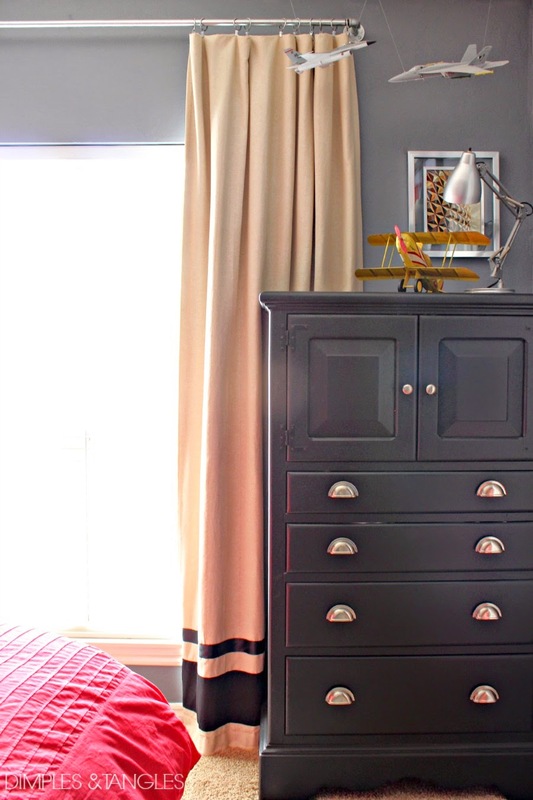 we did the same thing for rods in sawyer's room but used the black- i LOVE them! they are sturdy and look cool! Brilliant! both the curtain and the rod! putting this on my to-do list today! Cannot wait to see the whole room!! Love the curtains and the rod! You are too good with that sewing machine - your curtains look great! Oohhh and that headboard!! Can't wait to see it! Such a smart idea!! I wish you were closer so you could help me learn to sew better. :) they look fab!! 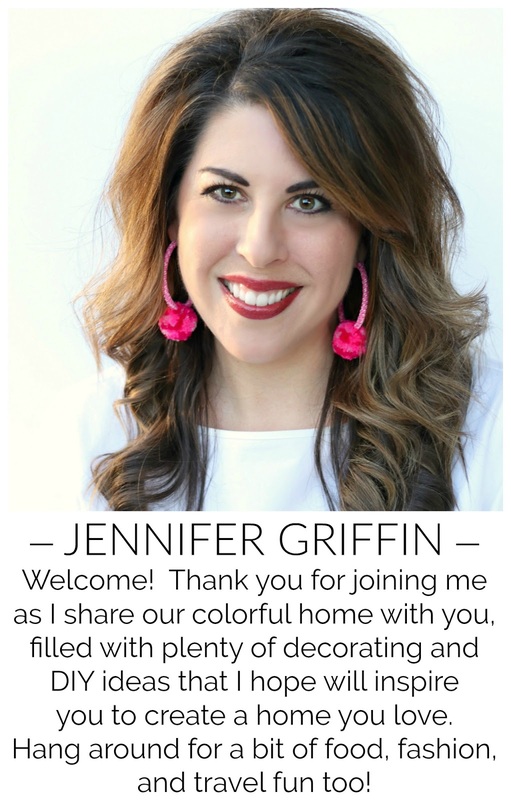 Love how you customized it Jennifer! You make me wish I could sew! I am obsessed with his room!! The room is really coming together! 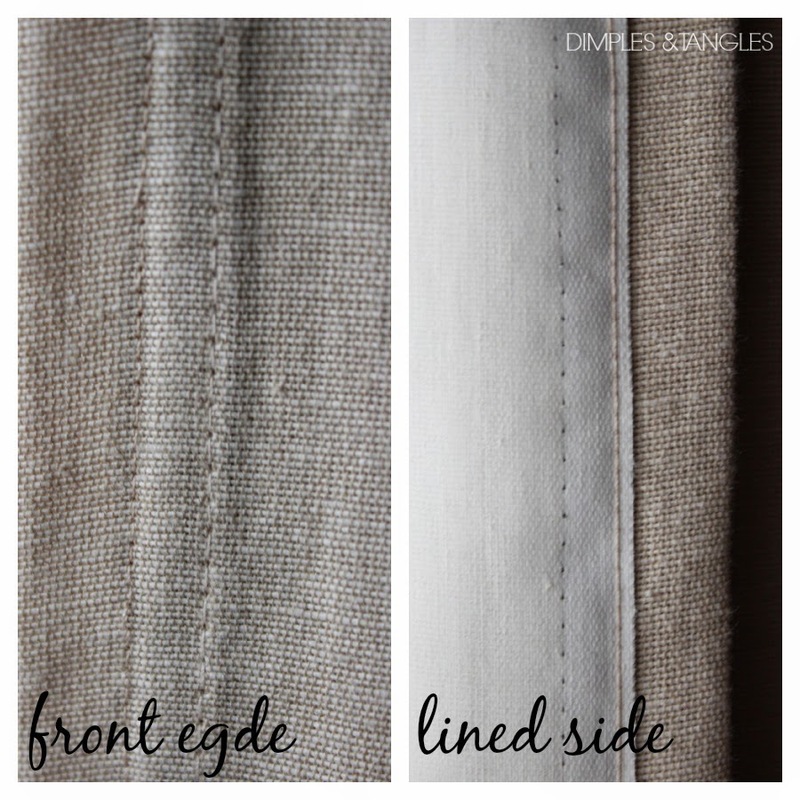 I love IKEA curtains, they are so affordable and easy to customize. The blackout lining makes them look so much better too! I love your curtains! The bold graphic across the bottom is fantastic. 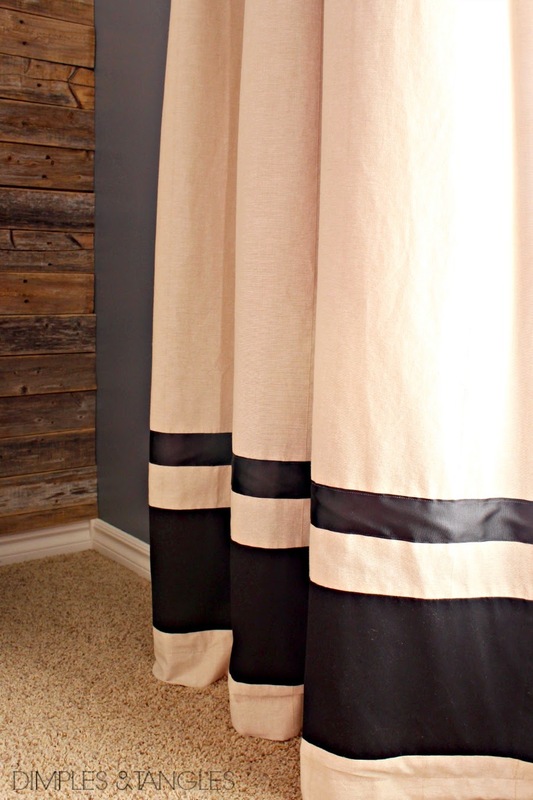 I've considered doing the pipe curtain rods, thinking it would be a cost saver. Once I priced it out, I took a different route! I love the look for a boys room, however. Absolutely worth the money! Love the custom stripe detail and re-using the blackout is so smart! I haven't shared mine yet because I've been waiting to add some trim detail, but I did Ikea panels in my LR, DR and FR before Christmas! It's hard to beat Ikea's prices! Love those curtains! Those simple stripes make all the difference! Love it all! I'm sure your son is very happy with his room. That "Duh" moment is so totally me, I have been known to describe thingies to the Lowes or HD people, and I always manage to get the "she's nuts" look. 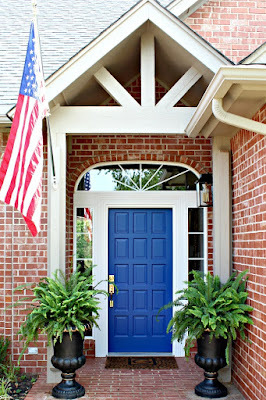 Great idea with the stripes on the bottom. I always have to add length to our curtains too. And I love the price of the Ikea ones, but you are right, they need liners. These look perfect!